Predation and brood parasitism have critical effects on the fitness of animals, but few studies have focused on the potential interactions between these two important selective forces. For instance, the egg-rejection process, one of the most important defensive responses of hosts against brood parasites, may be affected by variation in predation risk, which might divert their focus from the nest (present reproduction) to self-maintenance (future reproduction). In this study we explore the effect of predation risk on the first two stages of the egg-rejection process (judgment and decision) and if this potential effect changes according to the target of predation (adults vs offspring). To do so, we experimentally parasitized nests of common blackbirds (Turdus merula) with mimetic model eggs simultaneously exposing them to different predation-risk situations: adult predator, egg predator, and control. We found that predation risk did not affect egg recognition. Nevertheless, blackbirds exposed to the adult predation risk showed a significant reduction in the ejection rate, particularly at the end of the breeding season. We discuss our results in relation to the egg-rejection process and life-history theory. 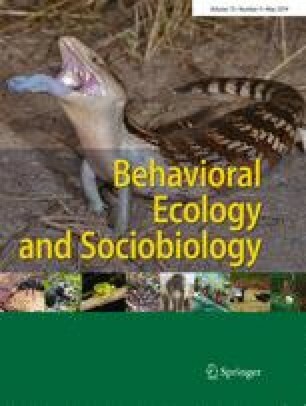 Our findings suggest that a predation risk directed to adults of parasitized nests, but not to their offspring, can play an important role in the blackbirds’ decision-making influencing the ejection of parasitic eggs, consequently affecting the outcome of the evolutionary relationship between brood parasites and their hosts. Brood parasitism and predation are two important selective forces in nature, which play a crucial role in the evolutionary process in birds. Despite this, few studies have explored the possible relationships between these two selective pressures. In particular, the possibility that predation risk affects host defenses against brood parasites has usually been neglected. Predation risk could influence the egg-rejection process, which is the main defensive measure adopted by hosts once they have been parasitized. In this study we showed that predation risk seems to modulate host defenses against brood parasites in common blackbirds, but depending on the threat posed by predators. In particular, adult predation risk affects the second stage of the egg-rejection process reducing the ejection rate of parasitic eggs. Our results open a new line of research in brood parasitism studies, demonstrating that external stimuli to brood parasite-host systems can influence egg-rejection decisions. The online version of this article ( https://doi.org/10.1007/s00265-019-2668-x) contains supplementary material, which is available to authorized users. We thank John C. O’Connor for improving the English and two anonymous reviewers and the associated editor for their constructive comments that helped to improve the previous draft. Financial support has been provided by the Junta de Andalucía (research project CVI-6653 to MS). We conducted the study following all relevant Spanish national (Decreto 105/2011, 19 de Abril) and regional guidelines. Ethical approval for this study was not required.